Hi Kurma, My Dad doesn’t eat garlic and so I am asking can you share a garlic-free hummus for me to prepare for his birthday. Peace, Bobbie. 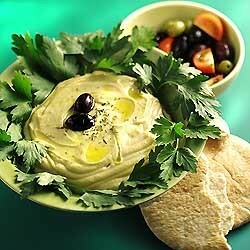 Hello Bobbie, here’s a nice hummus recipe, sans garlic. Homemade hummus is much, much better than any shop-bought version, unless you are purchasing the freshly made product from a traditional middle-eastern suppler. Truly authentic hummus is made from freshly soaked, boiled and peeled chickpeas – not as daunting as it sounds! If that’s all too hard, buy canned chickpeas, and proceed from there; but the result will definitely be inferior. Here in Australia, I use the Ord River chickpeas from Western Australia. 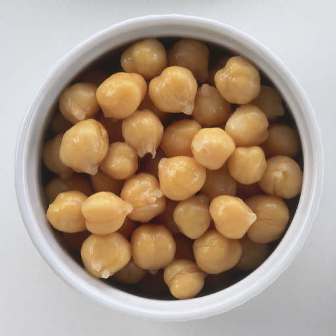 When cooked they produce big, soft creamy-textured chickpeas, ideal for hummus. Overseas readers should locate the largest chickpeas you can find. Big is beautiful in the chickpea world, I have discovered. This recipe makes 1 cups. Soak the chickpeas in cold water overnight or at least 6 hours. Drain and throw away the soak water. Place the chickpeas in a large saucepan. Cover with fresh, unsalted cold water, about three times the volume, and bring to a boil. Reduce to a simmer and cook for an hour or until the chickpeas are very tender, topping up with water if necessary. Drain the chickpeas, reserving the cooking liquid. Cool slightly then rub the chickpeas well to loosen the skins. Cover with cold water and the loose skins will rise to the surface. Scoop them off and discard. The chickpeas that didn’t give up their skins should be peeled for the best, creamiest hummus. Patience! Place the peeled chickpeas in a food processor with the lemon juice, asafetida, tahini and half of the salt. Process to a smooth puree, adding some of the reserved cooking liquid if necessary to achieve a smooth result. Add the remaining salt if it needs it.